It's eccentric, both in animation and story style. I'll keep watching because I like horror and because the episodes are so short, but this particular episode left me a bit nonplussed. It's about a policeman doing a ventriloquist's act on stage. It's an educational thing for the children. His doll is called Taro and his routine involves talking about how much Taro likes to ride his bicycle too fast. Now, we all know what happens with ventriloquist's dummies in horror. Sure enough, there's some business with the doll's head not turning. The cop freezes on stage, then something pops out of the doll and suddenly it can move and talk. By itself. What's more, it wants to say exactly the same things it had been saying when our hero was doing the voice. Apparently the accident hurt. The cop loses his cool a bit and... the end. "It hurt. It hurt." That wasn't what I'd expected, not least for the lack of an ending. It looks a bit like cheap Flash animation, but apparently it's an imitation of traditional kamishibai storytelling. Other episodes look the same, anyway, so it's not just a different style every week. I'm always up for a horror anthology, though. Let's see where this goes. It was the big new thing of 2014 in video game spin-off anime, to some extent taking over from Pokemon. It's all over the place. It's being broadcast in English on GO!, Teletoon, Toonami and Disney XD, if you know any children you think might be interested. The lead character is a boy called Keita (or Nathan/Nate in English) who's looking for bugs. He doesn't catch any. Instead he finds a ghost called Whisper with the most awesome evil grin. Whisper is a yokai, i.e. a Japanese oogie-boogie. Many yokai play pranks. In darker, more adult-targeted series, they do worse. Keita isn't interested in this, but Whisper decides to become Keita's unwanted butler (eh?) and together they embark on a life of wacky yokai-encountering. I'm tempted, partly because of the theme music. It looks fun. 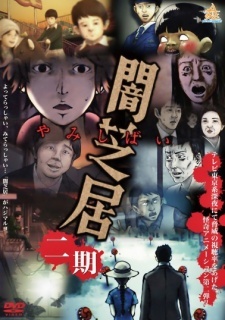 I like yokai shows, which are about freaky horror stuff (with the emphasis on weird). The Keita-Whisper relationship can be funny. However the show has a million episodes and I'd never reach the end, while you can tell it's a children's show. When Keita finds out that a gigantic oozing blob yokai is unhappy because she's had a fight with her husband, he makes everything okay with a speech about "if you talk to each other, it'll all be okay". 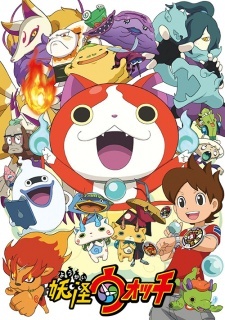 Jibanyan the Dead Cat is funny, but daft. Keita offering to let himself be possessed is slightly alarming and I bet he'll regret it in later episodes, but this is basically light knockabout fun. Also the end credits have CGI-animated dancing, which is way creepier and more unsettling than any of the show's supernatural elements. Will I keep watching? No, but I might check out a few random episodes from time to time. It looks amusing, if not something I'd watch religiously. I'm not the target audience, of course. Everyone says the show's really good. I enjoyed ep.1. Aniplex USA clearly rate it highly, because they'll be doing an English dub for the DVD even though they've only ever done that before for action anime. (Dubs are expensive and lots of people are snobbish about them, e.g. me, but they do increase the range of potential purchasers. They're a gamble that your show will be a hit.) Personally, though, I've decided not to continue. It's clearly my loss and I'd have gone for it had it been a 12-episode time investment rather than 22 plus an OVA, but I've got a queue of other shows I want to watch too. It's about a 14-year-old piano prodigy (Kousei Arima) who'd been trained to within an inch of his life by his wheelchair-bound mother. Two years ago, though, she died. Kousei had a nervous breakdown during a concert and abandoned playing. Now he appears to be living in a state of mild depression, sees the world in monochrome and thinks he's incapable of being loved. 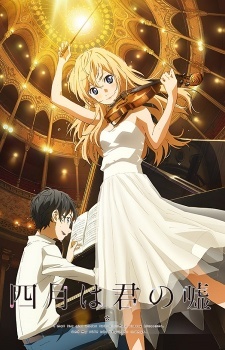 What he doesn't know, though, is that a vivacious violinist called Kaori Miyazono is going to coax him back to the world of music! 22 episodes of a piano prodigy? Maybe not. I don't hate pianos, by the way. I enjoy playing them, albeit loudly and badly. However I don't feel in the mood to spend over nine hours watching someone else do it. This is all about me and my personal preferences, of course, and I repeat that everyone says the show is really good. All the characters are fun, although their interactions fit fairly predictably into genre patterns. It's not hard to spot the ways in which the episode's setting up a Kaori-Kousei central relationship rather than one with Tsubaki, for instance. Kousei has some fairly serious issues and probably needed a psychiatrist. I enjoyed the episode, which I think is well-written and gorgeously produced. I'd happily watch more of this, but I'm not quite at the point where I'd watch 22 more episodes of it. It was close, though. 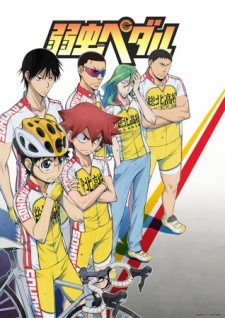 It's a sports anime about a school cycling club and I nearly gave up before I'd even reached the opening credits. It's a race. The whole episode's one big race. That I don't mind, but what nearly killed me was the hot-blooded, manly man, fight-to-your-last-breath testosterone. I also liked the character designs. The biggest freak looks like something you'd find dead on a slab, with staring goldfish eyes and a killer clown grin. Simple, but extreme. That was cool. The show is strong on the specifics of cycling. They make air visible to show us wind resistance! You couldn't do that in live-action. Every so often, you'll see currents of ectoplasm around a cyclist as a representation of air flows. That's pretty cool. There's the scary question of how late you dare to brake on a downhill curve. They also show us the difference between an ace and an assistant, not to mention exploring the feelings of someone who'd been demoted to the latter. Eventually I quite enjoyed watching this, but I still won't be watching this show. I'm not big either on sports anime or on racing. However I've heard that this show's really good. I can believe it is. It's just that I'm not personally into this genre. It's another of the mega-franchises. Yu-Gi-Oh! 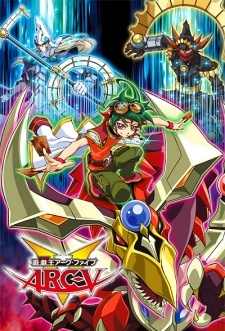 is a trading card game anime, in which the heroes play a fictional trading card game called Duel Monsters that is related in some way (without actually being) the real game you can buy in shops. Apparently the 2009 Guinness Book of Records said it was the world's best-selling trading card game. The main character (Yuya) is a boy who annoys his friends by not taking his Yu-Gi-Oh! battles seriously. His father pulled out of a public monster duel three years ago in a manner he found humiliating and he's over-compensating for that. Now, though, he's being invited to take his father's place in a rematch! I didn't like Yuya. He's winding people up and doesn't care. I didn't like the apparent message that irreverence and humour have a connection with shame, humiliation, being laughed at and being annoying. Obviously Yuya is going to turn out to be a wise fool once the fight begins, with method underneath his madness, but unfortunately the fight itself turns out to be quite boring. It's a turn-based card game and the "fight" is in practice all about the precise rules associated with each card. Playing Card A gives you two actions and lets you play Card B! I play this card with this effect! Aha, but I play this card with this effect! I'll recover Life points equal to half your monster's ATK! Half my ATK! Oh no! Of course playing a monster card makes the actual monster appear, but it's a slave to the cards. To be honest, I'd never had any intention of continuing with this series. If I got into Yu-Gi-Oh! and all of its sequel and spin-off series, I'd never have time to watch anything else again. It also seems likely that this particular episode rubbed me up the wrong way and I'd enjoy the rest of the show more. I still didn't like it, though. I've since finished it and... I think it's impressive. I prefer it to Madoka, but then again I'm not the biggest fan of Madoka. It looks pretty good, I've heard lots of praise for the show and I like the main characters. I'm happy to continue. It's an episode of two halves. The first involves four middle-school girls in their Hero Club. They write and perform puppet shows for kids, help find homes for kittens, etc. 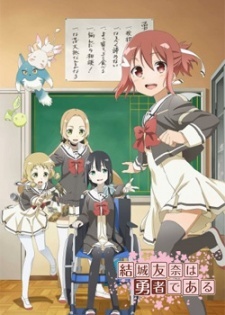 One of them is wheelchair-bound (but a demon at website design), which is quite an unusual choice for a anime heroine and in itself a point of mild interest. This real-world material can be funny (e.g. the puppet show) and it has two key conversations that are clearly going to be of huge thematic relevance later in the series. My antennae pricked up. Then, halfway through, there's an amazing multi-coloured magical waterfall effect that sweeps away the world. Heroes getting pulled into a fantasy dimension is a familiar anime idea, but its execution here is far more spectacular than usual. (Later, there will be transformation sequences and they'll look almost as special.) We'll discover that the Hero Club really is a Hero Club, unbeknownst to three of its four members, and we learn that you'd be surprised at the hidden functionality on the apps your friends might ask you to download to your phone. I've heard that this is another Madoka-influenced show (i.e. a darker take than usual on magical girls), but so far this seems like a good thing. The girls' fight feels convincingly like a fight. The characters are also good-hearted, especially Yuki Yuna. Seems solid and interesting so far. I'm looking forward to this one.